Polyneuropathie in the Leonberger breed shows a variable expression of clinical signs and different ages of onset. The symptoms of this polyneuropathy include wobbly gait and paralysis especially from the backhand. 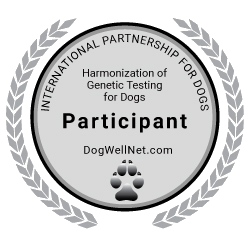 Affected dogs are not able to stand up in the final stage of the disease. Breathing noises, strange barking voice and difficulties in swallowing are other typical symptoms. The type 1 neuropathy (LPN1) in Leonberger is caused by a mutation in the ARHGEF10 gene. The disease starts at the age of 2-4 year (early onset) and shows a severe progression. The causative mutation causes around 11% of all polyneuropathy cases in the Leonberger breed. Recently, a mutation in the GJA9 gene could be identified to cause a second type of neuropathy in Leonberger (LPN2). The GJA9 protein is member of the connexin gap junction family whose members have emerged as important components of peripheral myelinated nerve fibers. The average age of onset of LPN2 is 6 years. LPN2 causes around 21% of all polyneuropathy cases in the Leonberger breed.